Since early Spring we have been looking after some tadpoles at school. They started out in a small tank in the Media Suite and are then moved outside the Office in the school reception area. Once the weather got warmer and the tadpoles began to change into frogs we returned them to their pond environment. You can click on the button to look at a guide on how to keep tadpoles. 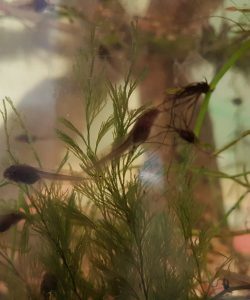 Our tadpoles have developed rapidly, and three of them had turned into frogs already by half-term! If you were observant, you may have seen the frogs in the smaller tank but they were very good at hiding under the moss and rocks in the terrarium. Now the weather is warmer the frogs and tadpoles have been returned to the wild to carry on their lives in the great outdoors, starting a whole new adventure! Here are the tadpoles enjoying their first meal of worms…looks like they were hungry! You can see that the tadpoles have settled into their new location in the reception area. They are getting bigger, and limb buds are developing on some of them too. Look at the detailed life cycle below to find out what will happen next! Here is a more detailed life cycle of a frog, showing the stages of development. Frogs are amphibious, which mean they can live both on land and in water. They have evolved this ability. Frogs start their lives as aquatic tadpoles with gills to breathe. As tadpoles grow into frogs, lungs replace the gills and allow frogs to breathe on land. But frogs can also breathe through their skin! Frogs’ skin is covered by a layer of slime that dissolves oxygen from air and water, and blood vessels present in the thin skin absorb the oxygen. Frogs have webbed feet, which help them to swim. Their long hind limbs help them to leap on land, and also make them powerful swimmers. Frogs are cold blooded, which means that their body temperature changes with that of the environment. While they are most commonly found in warm, humid places, they can also survive in dry and cold climates. Frogs’ eyes and nostrils are positioned high on their heads, which keeps them out of water when frogs swim on the surface. Frogs have a sensitive area on their backs that helps them to sense vibrations through water. Frogs which have a mottled appearance can change color to merge with their surroundings. Every living thing needs energy in order to survive and grow. The energy comes from the food that animals eat, while plants use sunlight, water and nutrients. A food web shows how living things get food and how energy is passed from creature to creature. In the food web shown here the frog gets its energy from insects, and in turn is eaten by foxes or birds.